Q – Do you have Fiamma dealers in my area? A – To find a dealer address in your area is simple in our web-site. Click on the “points of sale” and you will find the list of suggested dealers mentioned here. Q – Can I purchase Fiamma accessories directly from Fiamma? A – No, as a customer you can not buy directly from Fiamma. However you can place an order to your nearest dealer, listed in our partners-list (click to the “points of sale” button). Q – Can I purchase Fiamma spare-parts directly from Fiamma? A – To buy Fiamma spare parts please address your request to your reliable dealer. In case you cannot get the spare part you need or if you don’t find dealers in your area/country , Fiamma, exceptionally gives you the possibility to buy through our web-site directly from our warehouse the spare parts of the best selling spare part catalogue. Q – Are the Installation adapters standard delivered with my awning? adapters as the mounting system is different depending on what type of vehicle you have. Q – Can I equip my Fiamma awning with a 12Vmotor afterwards? from your dealer. Caravanstore and F35 Pro cannot be motorized. 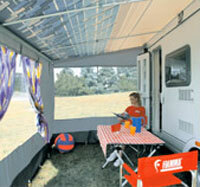 Q – Do Fiamma awnings always include a center rafter? Caravanstore (Item No. 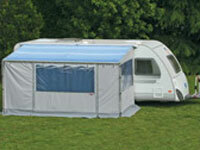 03888-01-) is standard included in the Caravanstore 4.10m and 2 pieces in Caravanstore 4.40m. In all other awning lengths the Rafter must be ordered as an option. Q – What can be used to clean my awning fabric? A – The best way to clean this material is with clean water and a cloth or a soft brush. If it is very dirty, add some degreasing detergent to the water. Make sure to rinse carefully any remaining detergent on the fabric. Q – What is the difference between the F45i awning and F35 Pro awning? A – The F45i awning is the top of our line, elegant, strong and easy to use. It is operated by turning a crank handle on one end to extend and retract the awning. 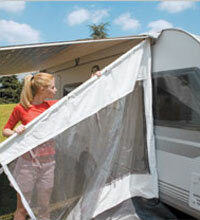 The F35 Pro awning has a smaller diameter case, is less expensive and lighter. The operation is manual and requires rolling in and out the fabric by hand. Q – Does my awning have support legs? A – Yes. Support legs are included in all our awnings from the 2.50m on. They are attached permanently to the awning and fold up inside the housing when the awning is closed. Our Eagle and Fiesta awnings are self supporting and do not include support legs. Q – How far can I extend the awning? 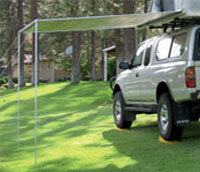 A – You can roll the awning out all the way or stop at any distance you prefer. 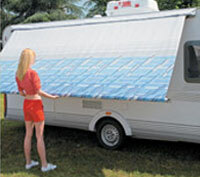 When the awning is fully extended the fabric will sag, just roll it back in about one turn. Q –Can I use my awning to protect me from the rain? A – The awning is meant to shelter you from the sun and moderate rain. Therefore, we recommend you to close the awning in case of strong wind, heavy rain or snow. For moderate rain use the center rafter and lower one leg to allow water running off. Water pooling can stretch the fabric causing faulty closing. Be careful because the fabrics which present this kind of problem are not covered by warranty. Q – Can I drive when my Caravanstore is mounted? A – For small and longer distances, you can leave the Caravanstore mounted on the vehicle. Please consider that the vibrations can make the awning beat against the wall of the vehicle causing noise. Q – On which awnings can the Privacy-Room be installed? A – The Privacy-Room is available for all F45i, F45i L and F1 awnings. The Privacy Room cannot be fitted on models produced before the F45 Elegance. The Kit Privacy O (which is standard delivered with thePrivacy Room) allows the installation of the Privacy Room on the Thule Omnistor 5002 awnings too. Q – Is the Privacy-Room a tent awning? that the Privacy-Room is not a permanent tent and needs, in case of storm and wind, to be closed completely like the awning. 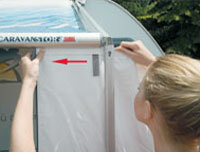 Q – Is there a side panel that I can use on my F45 awning at the left-hand and/or right-hand side? (Blocker F45) is available, suitable for all Fiamma awnings of any production year, as well as most other awning brands. Q –Will the rear of my vehicle be strong enough to install a Carry-Bike? A – Most of the vehicles don’t show any problem in mounting a Fiamma Carry-Bike, but as the supports in the rear of vehicles differ from manufacturer to manufacturer we suggest you to contact the dealer or the manufacturer of your vehicle in order to locate the most suitable installation points. Q – Is the installation kit standard delivered with the Privacy-Room? bag, suitable for transporting goods in the storage compartment or the Privacy during travelling).